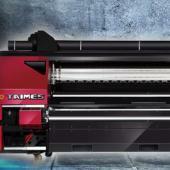 1.With 3 tons of high quality metal materials and countless precision components, taking 20 months, TAIMES invents such super production and reliable digital printing machine - BluEx100. 2.BluEx100 printer is applied with Konica Minolta KM1024 super wide printhead, 16 heads cover over 288mm printing width, completely promotes gorgeous colors and hurricane speed. Copyright © 2013 Cenadart Sdn Bhd. All rights reserved.